Ready to have customers find your local business online? Not sure where to start? Well you better get ready to get very familiar with Google my business. You may not know of it by name, but you’ve certainly interacted with it. If you already have access, you can skip this step. If not, you’ll either need to claim it or recover it or set it up for the first time. Search for you business on Google. Do you see something like this? If so, your business already has a Google My Business profile. While signed into your Google account, go to business.google.com. Search for your business in the box using your business name and city. Select your business listing. At this point, you may have to verify your listing. Options for verification are on a case-by-case basis. Sometimes you can choose to receive a call with your verification code right away. In other cases, you will have to have Google send you a postcard in the mail with your code. After initiating the postcard, it should arrive within five business days. Once you receive it, simply follow the directions on the card and enter your code when prompted online. Once you have access to your account, the real fun begins. Add a profile picture, a cover photo, your logo, a team photo, a photo of the interior of your business, and any more great (authentic, not stock) photography that you have. Fill in all the fields possible including --- business hours, phone number, EXACT address. 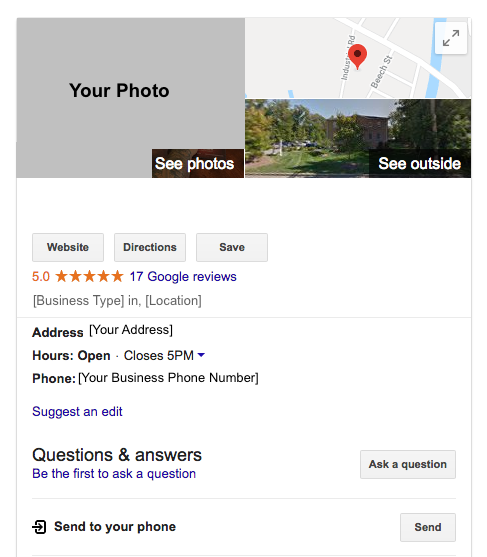 Google My Business is a great place to share quick updates with your customers and prospects. You can add images, link to pages on your site, and even create events. When you publish an update here, it will show up directly underneath your GMB profile in the search results page. Try and be consistent and post often. Shoot for about once a week. Don’t incentivize them, as that is against Google’s policies, but do politely ask your happy customers to leave you some feedback on Google. Once you have at least 5 reviews, your profile will become more visible and prominent in the search. Customers will see your business as more trustworthy and established than your competition who has few or no reviews. Ask your customers to be detailed and actually type out a review as opposed to simply leaving a 5-star rating. In your profile, the Insights tab provides a lot of useful information about how often your listing is showing up on Google search and on Google maps. Look at the trends over the last three months. Are you improving your visibility or is it stagnant? You can even see how many times someone has clicked through to your site, clicked to call your phone number, or clicked to ask for directions to your location. Here’s a look at the Customer actions portion of the insights tab --- notice the metrics for visits, directions, and calls. Once you have your GMB listing correctly set up and optimized, your going to want to make sure that this info is the same all across the web. Do you have an old phone number on your Facebook? Or your old website URL on Yelp? These types of inconsistencies can hurt your chances of showing up. If you’ve been in business a long time, your bound to have some inconsistencies out there --- so it’s worthwhile to spend some time to clean these up. There is software available that handles all this for you --- so we highly recommend you either engage with an agency, or implement software like this to save you time and energy. Don’t respond to scam calls of people claiming to be from Google who want to help you with your account. Google will never call you unless you specifically request a call through their Google My Business help portal. Just ignore these people. And certainly don't give them any sort of payment or personal information. Hit all these points and you’ll be well on your way to increased search engine visibility and more leads hitting your site. Are you in the electrical contractor business? You're in luck. We have a local SEO guide specific to your industry. Have questions? Want a professional assessment of your local search situation?